Time for another Throwback Thursday post! This one is all about my favorite nail polish colors. I originally posted this about spring polishes, but after looking back—these remain my favorite colors all year round. I would add a few to this list for fall/winter… especially since it’s been well over a year since I put up the original post and updates are always nice. I would add Formula X ‘Pyrotechnic”—it’s the perfect red, Essie ‘Sand Tropez’ for a beautiful neutral, and Essie ‘Wicked’ for a super vampy dark red. Also have to mention how much I’ve been loving this cuticle oil. It’s amazing! I have a love hate relationship with nail polish. I absolutely love having a bright, cheery color on my nails, but I hate doing them myself, don’t have the luxury of going to get a weekly mani done by the pros, and really only enjoy the color for a couple of days. Not only do I have color ADD, but I just can’t stand having chips. I’d rather have no polish on at all than have a beat up mani. So often you’ll find me with nothing at all on my nails. But when I do decide it’s time for some color on the tips, these are the polishes I usually turn to. 1. REVLON COLORSTAY GEL-SHINE TOP COAT // This stuff really does make your nails look like gel. It smooths the color (minimizes any goofs), dries extremely quick, and is very shiny. 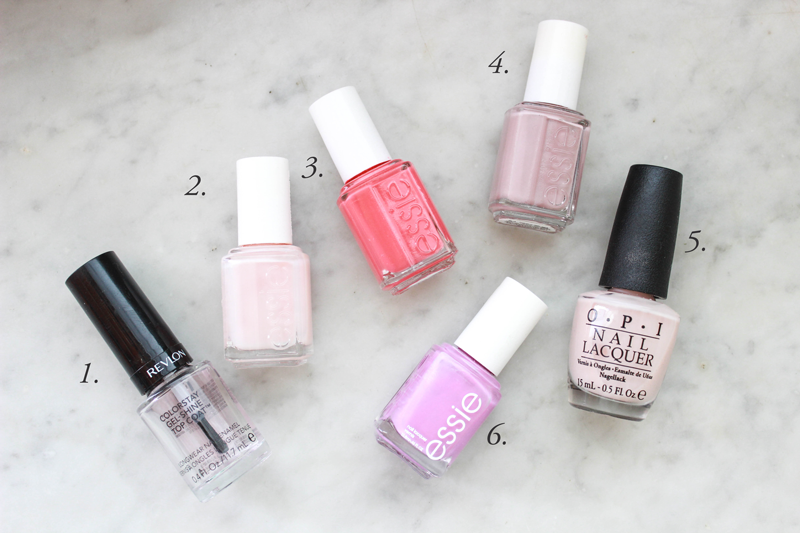 I’ve tried many – Essie, OPI, Seche Vite, etc. and this is by far my favorite. 2. ESSIE “SUGAR DADDY” // It’s actually drastically more sheer than how it appears in the bottle. It’s almost a clear polish, but it gives your nails the most beautiful and natural pink tone. If I’m just wanting a clear shine, this is always what I go for because it does just that, while making my nails look healthier than ever before. 3. ESSIE “CALIFORNIA CORAL” // Just a perfect peachy tone that’s not too pink and not too orange. 4. ESSIE “LADYLIKE” // Just as the name entails, this is truly the most feminine polish I own. It’s a beautiful mauve tone that has the magical power of making your fingers look twice as long. 5. OPI “BUBBLE BATH” // Absolute favorite neutral. It’s just good. 6. ESSIE “SPLASH OF GRENADINE” // I LOVE this color. It’s different enough, while not being too far out there. It just makes me happy every time I wear it. Have you tried Dior Nail Glow? I am ADDICTED. I put it on for the first time and thought I had wasted my money. Then I removed it and my nails looked dry, brittle, and gross without it! It's meant to do what you mention Sugar Daddy doing. I put it on my nails anytime I don't want color-only one coat needed and they look perfect. Bubble bath is always my go to! Love that cuticle oil! It smells SOOO good.